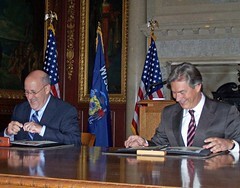 A new emphasis on cooperation between Wisconsin and a Canadian province. Governor Jim Doyle and Manitoba provincial Premier Gary Doer sign a Memorandum of Understanding, to promote collaboration and trade. The governor says Wisconsin is one of Manitoba’s most important trading partners – and the energy sector is growing. Premier Doer says Wisconsin and the region are moving in the right direction. The MOU encourages “collaboration in supporting a climate of research, innovation and technology development.” According to Doyle’s office, trade between Wisconsin and Manitoba amounts to 900 million dollars annually.